Got back to San Pedro on the 23rd of May. Killed some time in San Pedro until my orders came, and then went to S.F. 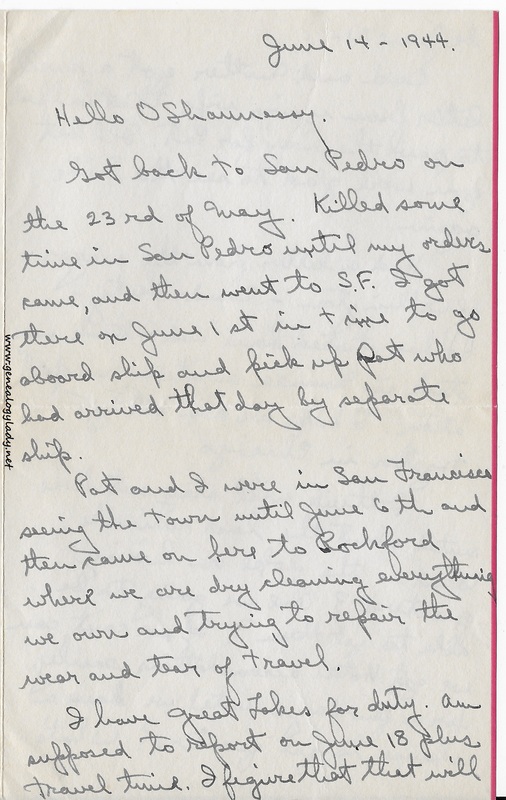 I got there on June 1st in time to go aboard ship and pick up Pat who had arrived that day by separate ship. Pat and I were in San Francisco seeing the town until June 6th and then came on here to Rockford where we are dry cleaning everything we own and trying to repair the wear and tear of travel. 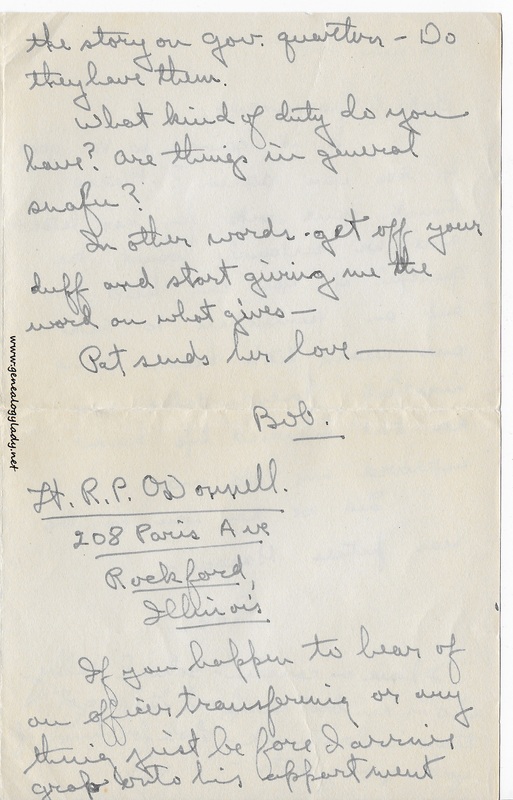 Dad and Mother got a swell letter from your wife that helped to pave the way for Pat. I’ll bet you were glad to see the kids again. Had a letter from the Mayor of Wellington – Comdr. Lentz – He has started home and I think was stuck in Noumea awaiting transportation. I hope we can all get together in Chicago. [page 3] the story on gov. quarters – Do they have them? Is it going to be good to see you again? 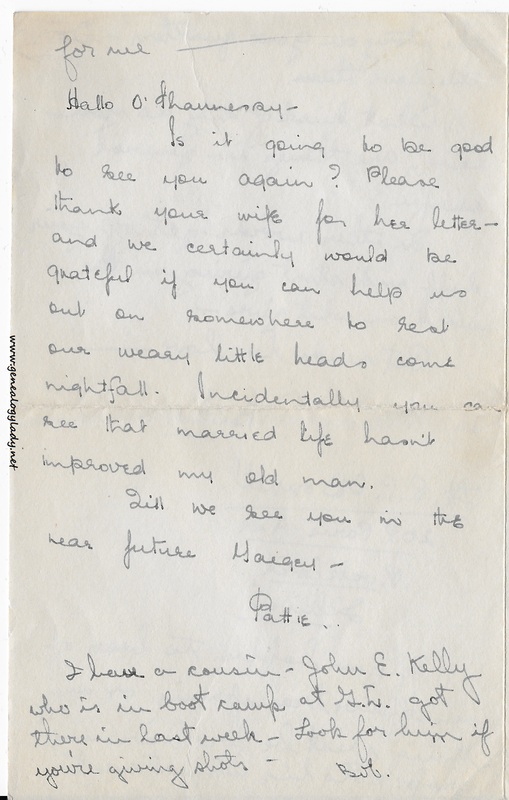 Please thank your wife for her letter – and we certainly would be grateful if you can help us out on somewhere to rest our weary little heads come nightfall. Incidentally you can see that married life hasn’t improved my old man. 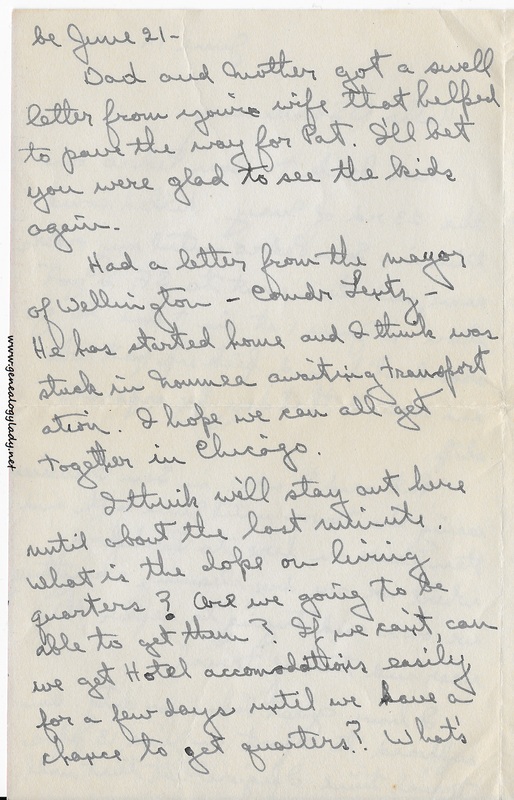 This entry was posted in Genealogy, World War II Letters, Yegerlehner and tagged genealogy, Gladys R. (Foster) Yegerlehner, Great Lakes Naval Hospital, John E. Kelly, Navy Base Hospital #4, Pattie O'Donnell, Robert P. O'Donnell, Roscoe S. Yegerlehner, United States Naval Reserve, World War II, World War II letters on March 5, 2016 by Deborah Sweeney. It’s so sad that the Roscoe-Gladys letters have come to an end. But I’m glad to know that there are other letters and documents to share. But wait! Where did I say the letters were over? I said there was a break!